Jophrey was a worker at Jurassic Park, whose duty was gatekeeper of the Velociraptor pen. 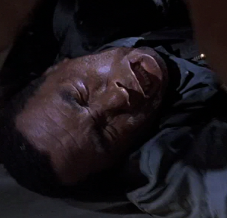 While Robert Muldoon oversaw the transfer of one of the Velociraptors to the pen, disaster struck: the raptor grabbed Jophrey and pulled him into the crate. Despite Muldoon’s best efforts to save him, Jophrey was mauled to death by the dinosaur. His family was just one of many to come who would file wrongful death lawsuits against InGen, and they weren’t the last. Jophrey’s death led to a $20 million dollar lawsuit and the insistence of Jurassic Park’s investors that a thorough, on-site inspection of the Park be performed by third parties, including vertebrate paleontologist, Dr. Alan Grant. Jophrey was played by Jophery C. Brown.